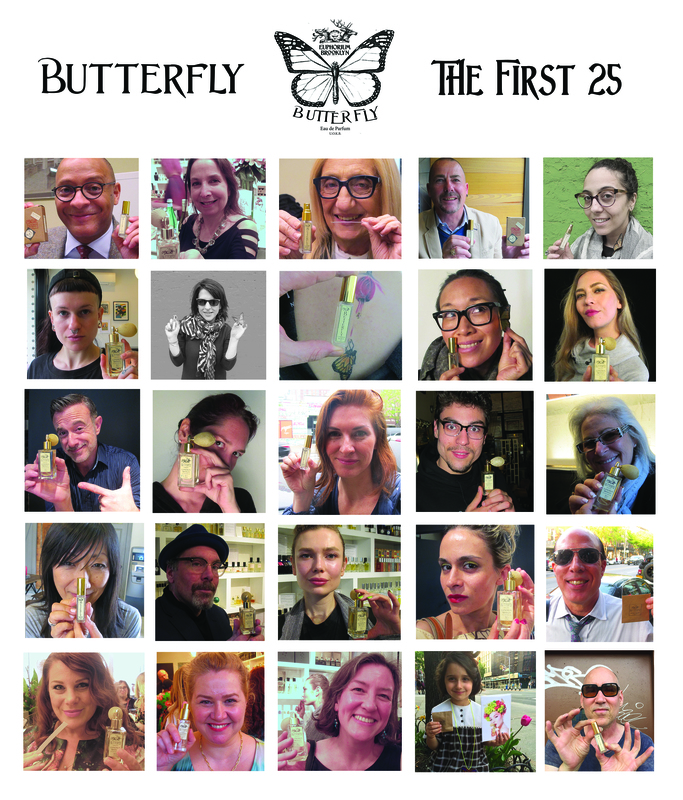 BUTTERFLY Eau de Parfum for Women and Men. 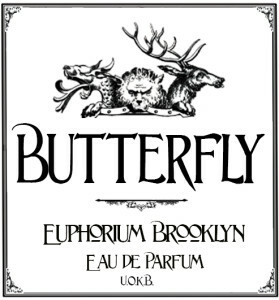 BUTTERFLY by Euphorium Brooklyn from stephen dirkes on Vimeo. 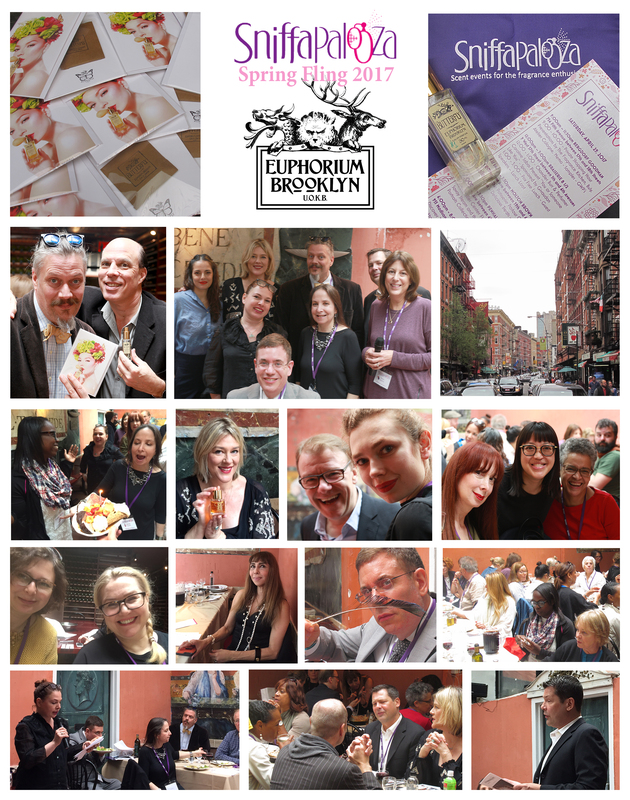 Located in the Greenpoint neighborhood of Brooklyn’s northern most waterfront cradled by both the New Town Creek and East River, Euphorium Brooklyn has long been an oasis of decadence in the midst of an industrial wasteland. From early 18th century settlements and the development of 19th century boat building & chemical industries, the New Town Creek waterfront has been bordered by abandoned industry and empty lots for decades. In these “wilds” of North Brooklyn, stands of milkweed, grasses, and wildflowers flourished along the water’s edge and have remained largely intact until the present. 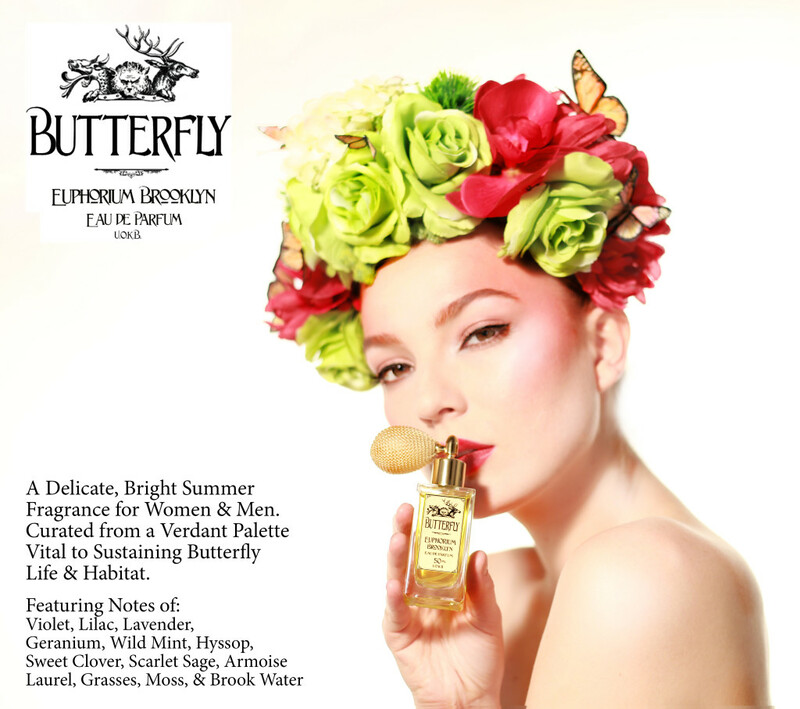 BUTTERFLY Eau de Pafum is based on the fragrant plant life that sustains butterflies and their habitat. Although perhaps a peculiar starting point to develop a fragrance palette, butterflies have done a remarkable job of curating a wide range of fragrant floral, mint, grass, & herbaceous notes for a perfumer to work with. 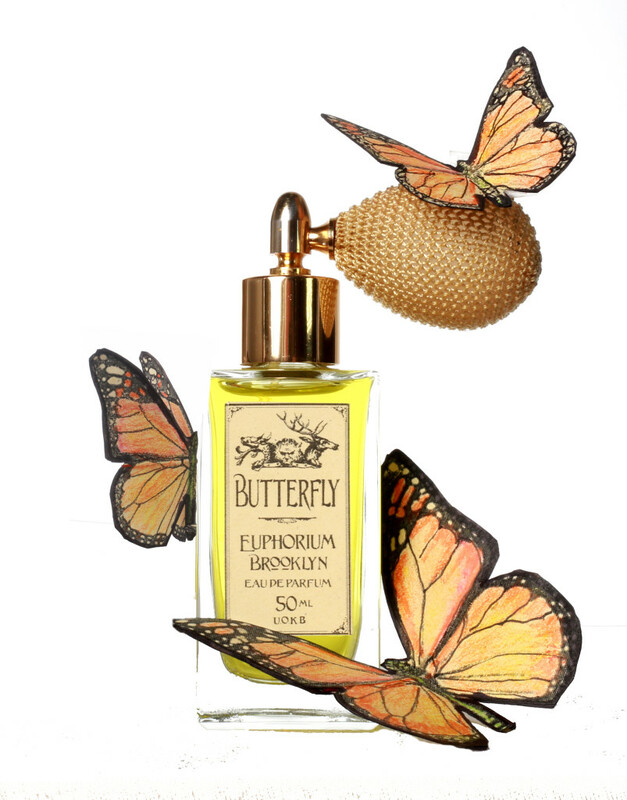 Euphorium Brooklyn Butterfly Eau de Parfum from stephen dirkes on Vimeo. Etienne Chevreuil spend many an idle hour in the summertime laying in the fields and meadows surrounding his family’s estate in Grasse, France. In one particular grotto, in a clearing in the woods, Etienne would luxuriate in wildflowers, mint, grasses, & mosses by the edge of a small brook. From a reclining position, he could take in the beauty and fragrance of the scene. 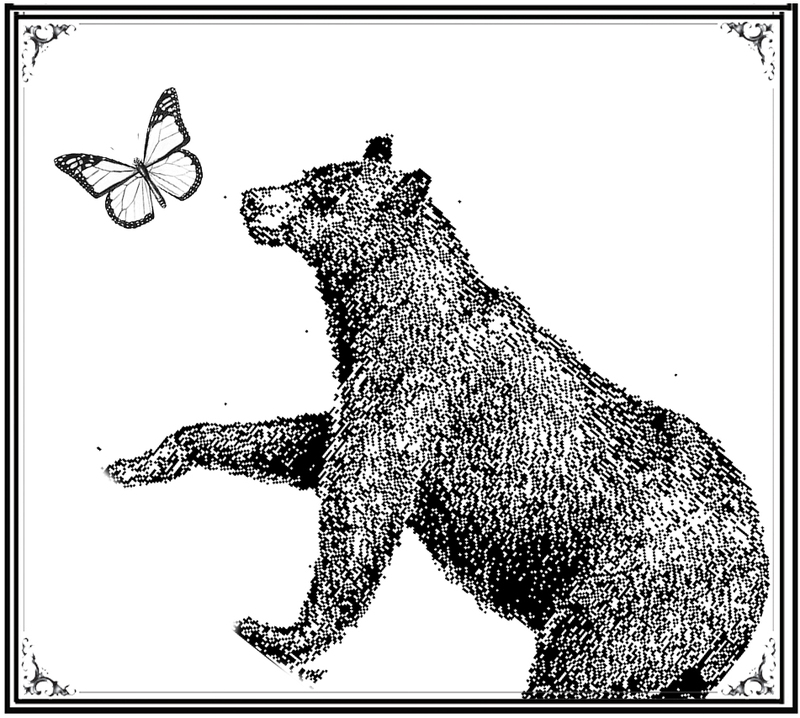 Following the flight of a butterfly, his eyes led his nose through the butterfly’s fragrant curation of Violet, Lilac, Lavender, Geranium, Marigold, Wild Mint, Mountain Laurel, Hyssop, Milkweed, Scarlet Sage, Armoise, Sweet Clover, Grasses, Moss, & Brook Water. 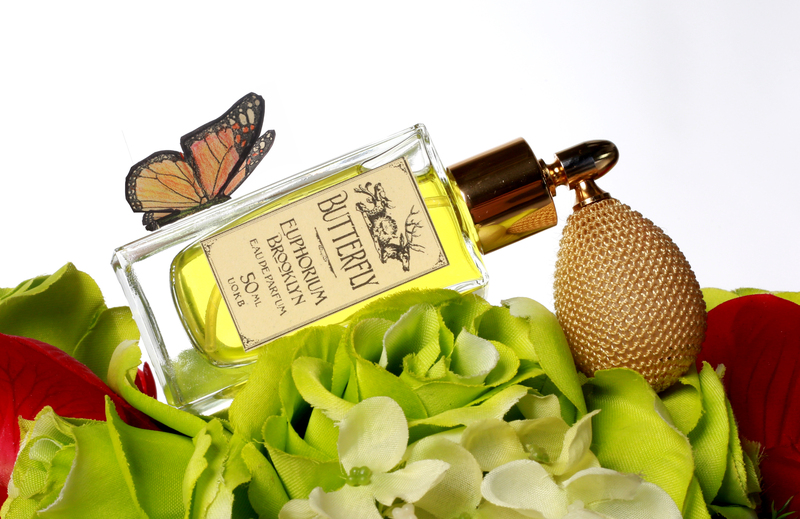 Young Master Chevreuil was intent on distilling the flora selected by the butterfly to capture the bucolic summer setting in scent. 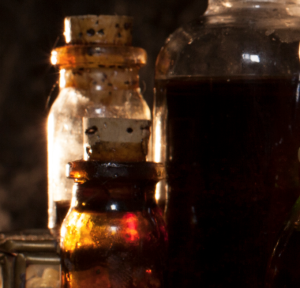 Etienne wished to emphasize the softest ephemeral nature of the sunlight, water, grasses, moss & mint in favor of the familiar violet, lilac, marigold, and wildflowers that so often have opportunity to radiate in the perfumer’s studio. By his own description, “I am a story telling in scent. 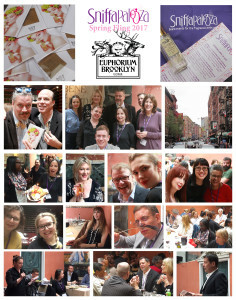 It is the Olfactive Journey or Olfactive Tableau I wish to create. 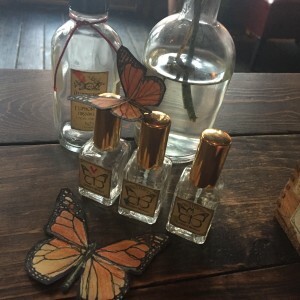 I am no perfumer, find your rose water and candied confections elsewhere.”, it was the environmental tableau of the landscape he wanted to portray in scent, complete with sunlight, water, meadows, & mosses. 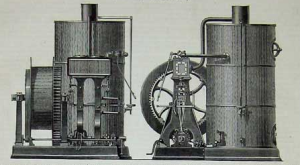 Etienne had a long standing interest in transformation or metamorphosis and had made extensive observations of the flower’s growth from seed to seedling to blossom. He soon became fascinated with the butterfly’s transformation from egg to chrysalis to first flight. He saw this as a poetic metaphor for our personal growth and transcendental nature. 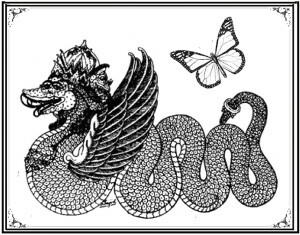 What would come to be an intellectual cornerstone in the Euphorium Brooklyn concept of “Knowing-Becoming”, Chevreuil thought that the butterfly’s final winged manifestation was in a way, the reward to the patience, struggle, and suffering that often accompanies significant change. After consuming a particularly potent psychotropic elixir, Eteinne lost consciousness in the French woodlands for several days. Mr. Chevreuil claimed to have had the experience of becoming a butterfly larvae while unconscious and through a very slow yet ecstatic metamorphosis became a butterfly himself. He described his burst into consciousness as a sensual release of sorts and awoke to a cloud of butterflies suddenly alighting from his body. Mr. Chevreuil sought to emulate the butterfly’s “gorgeous display of finery and penchant for aimless wandering” in his own daily life. 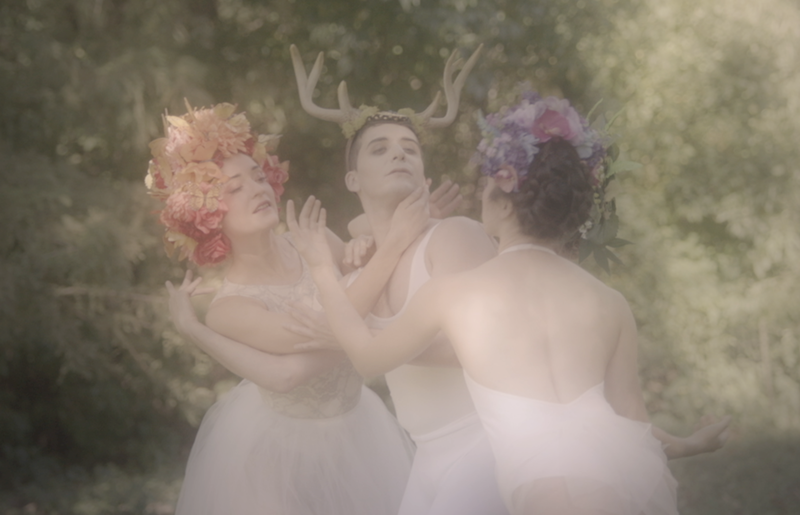 Mr. Chevreuil composed a scenario, commissioned the interpretive skills of a now famous Russian choreographer, and employed the finest dancers to premiere, “BUTTERFLY in the GLADE – A Ballet and “Tableau Olfactif in Two Acts” for a private performance held in conjunction with the launch of his BUTTERFLY Eau de Parfum. Performed to the accompaniment of what was described as a “motley group of self-proclaimed musicians, charged with the task of evoking whispering winds, growing wings, and the triumphant flutter of first flight”. 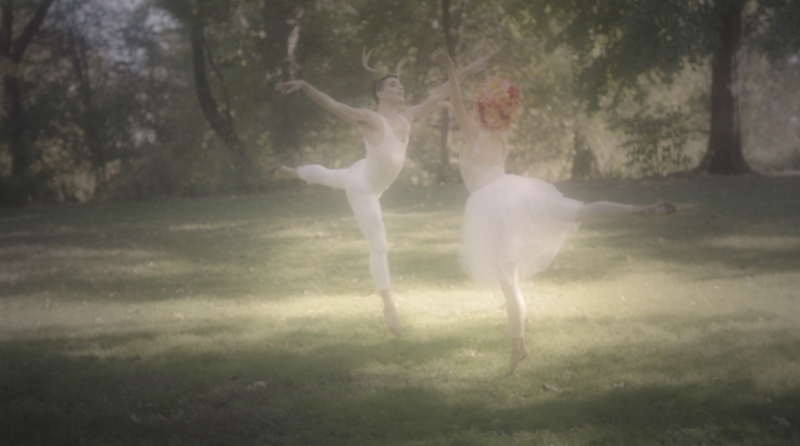 Whether it was the highly sensual nature of the ballet performed that evening led to what was described as “the orgiastic debauchery of those in attendance”, the “enormous balloons releasing a special perfume crafted for the performance from overhead”, or the warm, moonlit summer night, several reports indicate extensive hedonistic revelry took place amongst the participants until the morning dew. 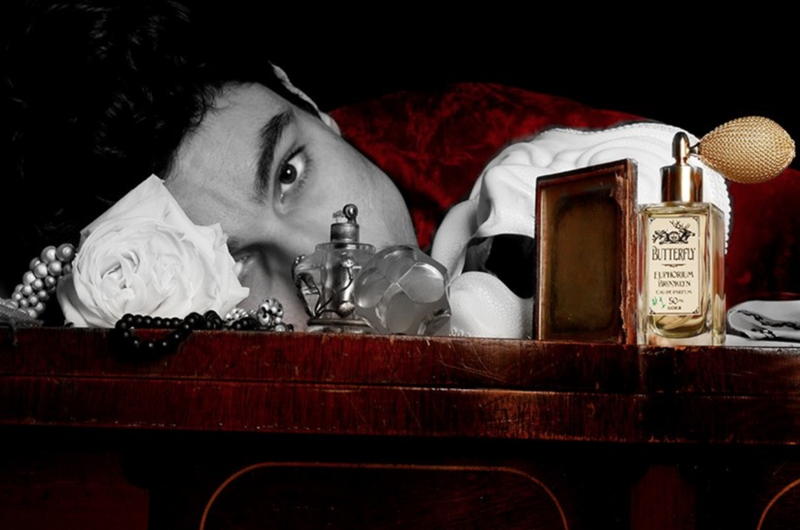 Christian Rosenkreuz had made a significant part of his life’s work to be the study of toxins and he developed a particular interest in relationships of co-dependence of various species regarding toxins and self preservation. 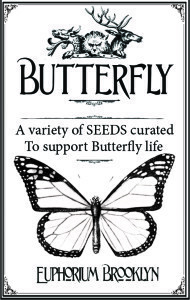 Rosenkreuz was intrigued by the relationship of butterflies to the highly toxic milkweed plant. Seemingly unaffected by the milkweed’s toxins, the butterfly would lay eggs in the plant as a means of defending the next generation from predators. 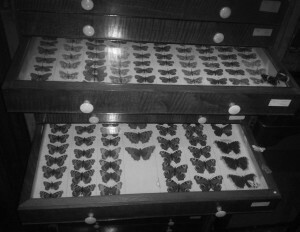 Beyond habitat, Rosenkreuz observed that butterflies had the ability to safely transfer the plant toxins to its exoskeleton to repel predators by making itself toxic. 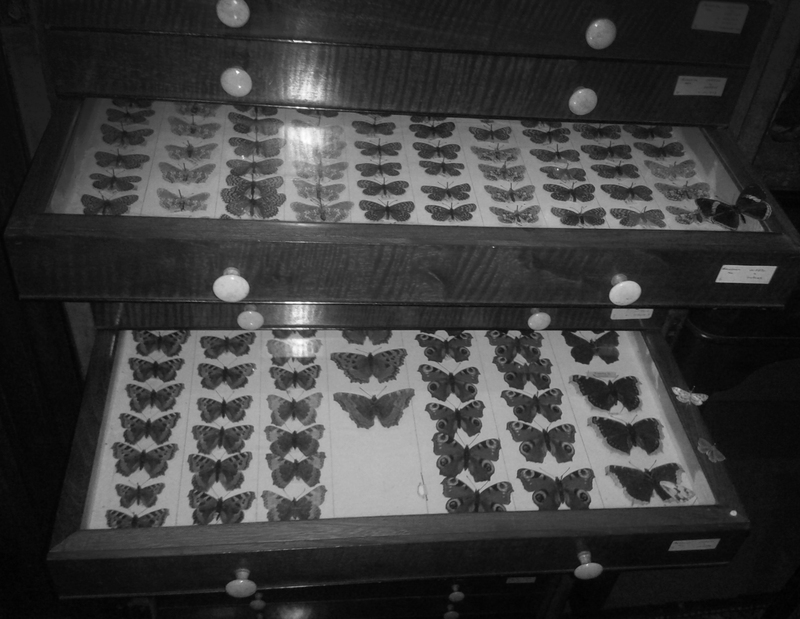 Rosenkreuz made exhaustive efforts to collect, identify, and tincture the wings of some 3,000 species of butterfly. 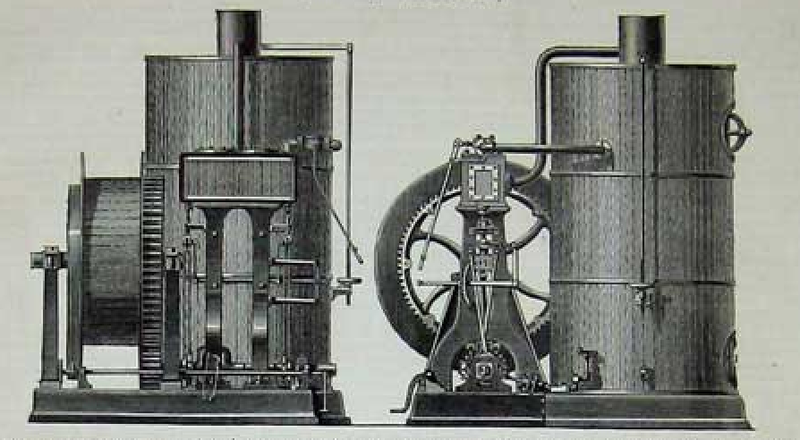 The ambition for his tinctured archive is unknown as there seems to have been no documented scientific or creative outcome from his research. 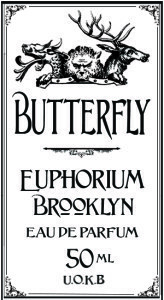 Christian Rosenkreuz’ butterfly research might have further refined his associations of alchemical transformation in his understanding of the Euphorium Brooklyn’s concept of “Knowing-Becoming”. 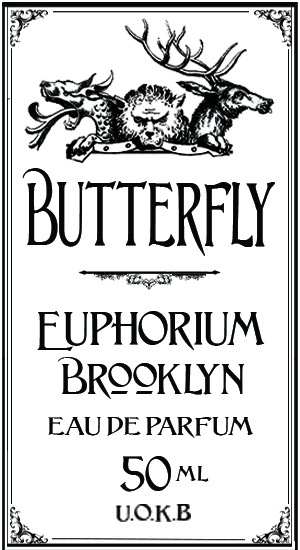 Presented to both Etienne Chevreuil and Christian Rosenkreuz in the early 1860’s at the formation of the Euphorium Brooklyn, Rudolph Komodo had composed an epic poetic saga entitled, “The Butterfly and the Dragon”. With personal study overlapping Rosenkreuz’ work in the field of toxicology and perhaps influenced by/ influencing Chevreuil’s creative output on butterflies, Rudolph Komodo drew connections between what at first seem to be two vey disparate creatures. Rudolph often praised the virtues of being lost, or ambling without regard. 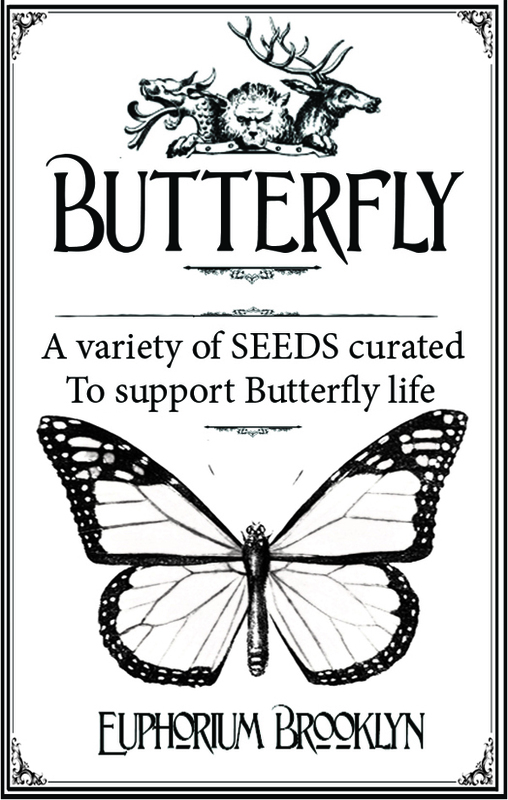 The butterfly became a symbol to him of the unimaginable journey that can be made while at not point a sense of direction, intention, or purpose can be detected. Komodo was fascinated by the incubation process undergone by both Komodo Dragon eggs and butterfly larvae. He felt that the dream visions he had when in a drug induced semi-catatonic state enabled him to access pre-conscious memory and draw him closer in transcendental spirit to the butterfly. 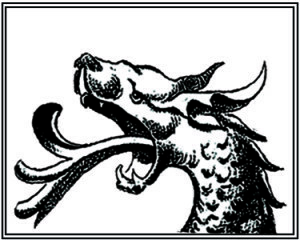 Komodo had hoped to discover some intoxicating, drug-like effects from the butterfly though Christian Rosenkreux toxicological studies, but found none. 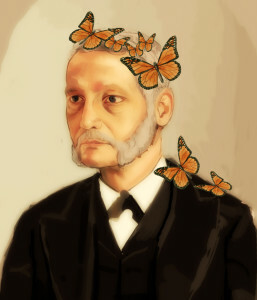 (see “The Inhalation of Butterfly Wings & Its Effect as Observed in 7 Methods of Delivery: A Report” – Rudolph Komodo, 1863). 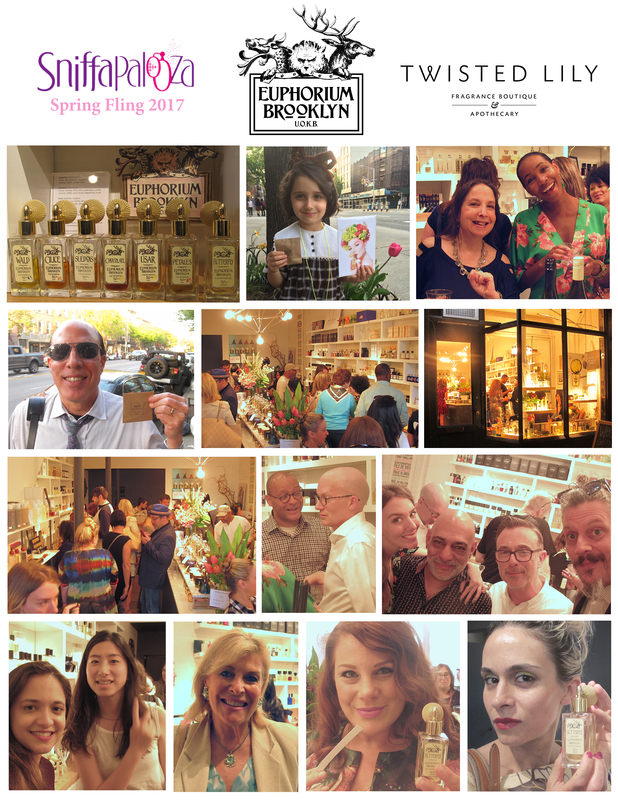 Thanks to the generous support of Sniffapalooza’ Spring Fling 2017 & Twisted Lily Perfumery, we are able to have a special sneak peek of BUTTERFLY on Friday, April 28th, 2017 at Twisted Lily, 360 Atlantic Ave., Brooklyn and presentation on Sunday April 30th, 2017 at La Mela Restaurant, 167 Mulberry St., Manhattan (Little Italy) for the special Spring Fling five course luncheon. 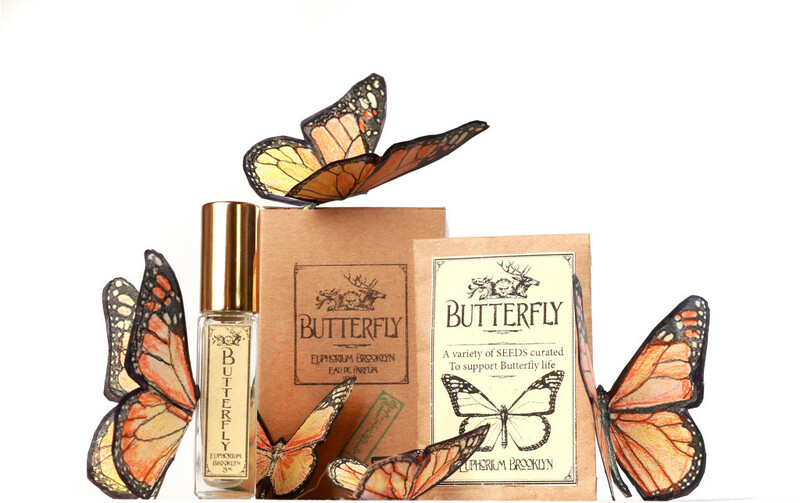 BUTTERFLY EdP FIRST ENCOUNTERS from stephen dirkes on Vimeo. 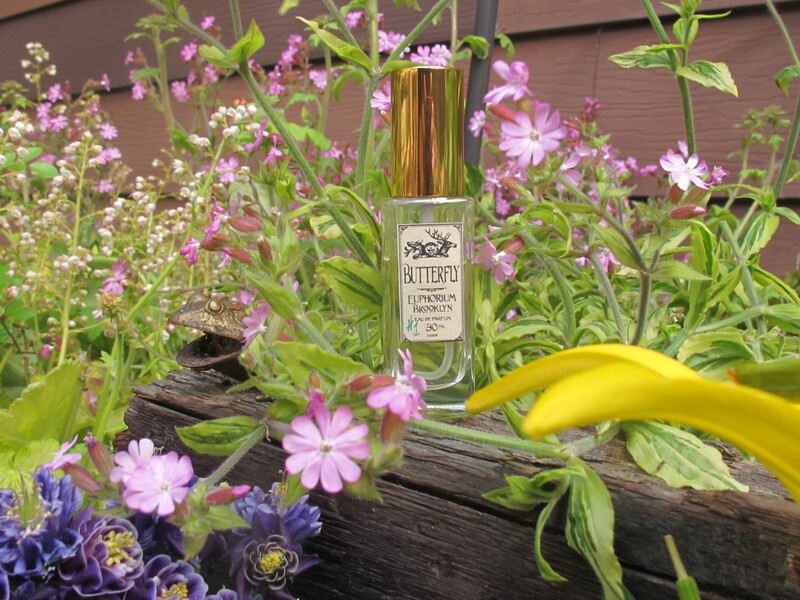 Sebastian Jara & Kara Marie’s video review of BUTTERFLY for Looking, Feeling, Smelling Good. Ida Meister’s BUTTERFLY review for Fragrantica. 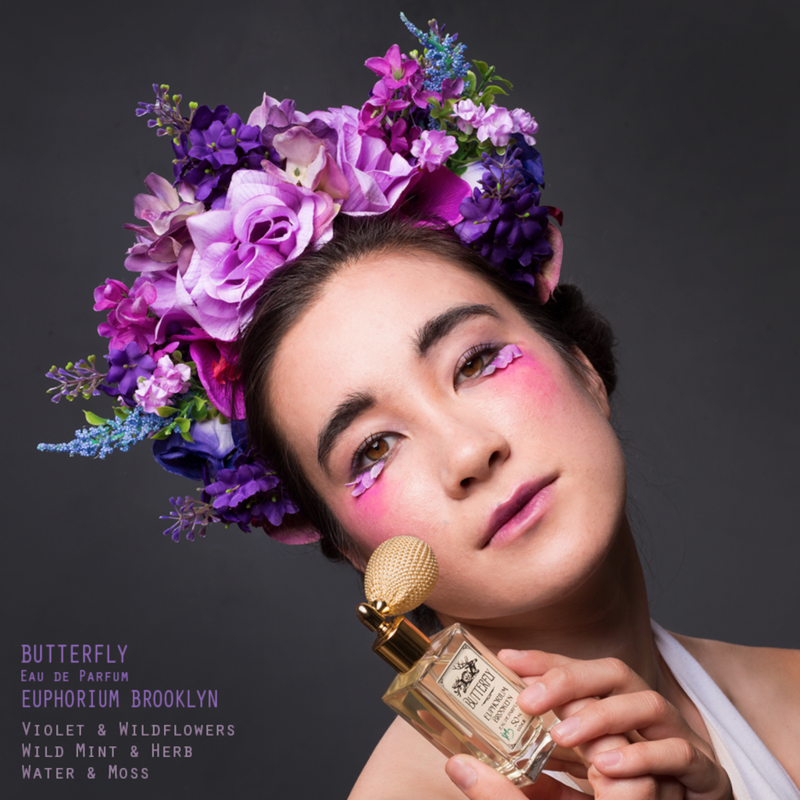 Robert Herrmann’s BUTTERFLY review with Michelyn Camen, art direction/ EIC for Cafleurebon. 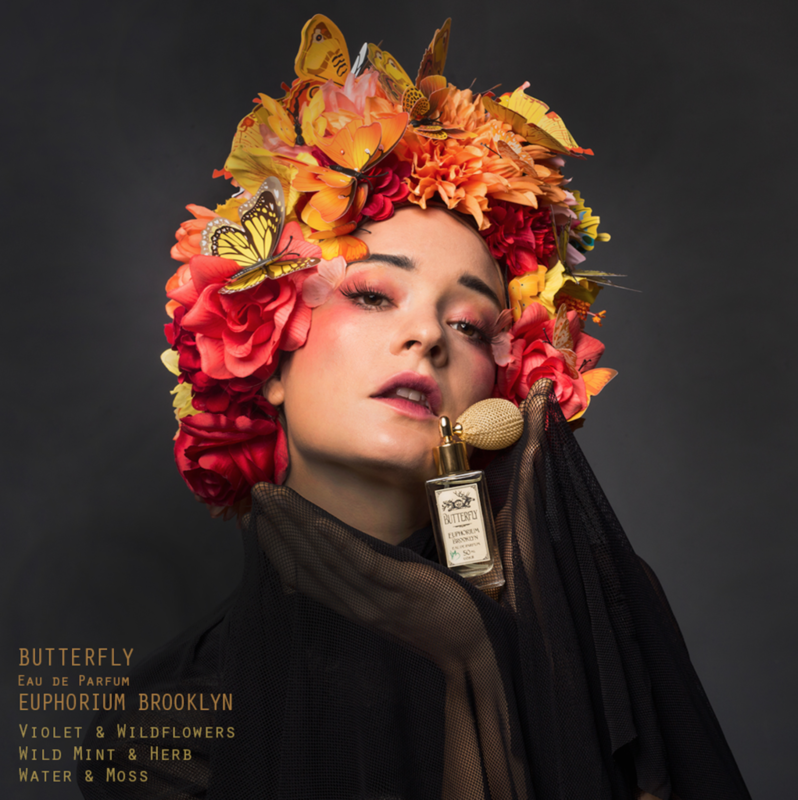 Brooklyn Fragrance Lover & Redolessence BUTTERFLY video review. Max Heuslers’ BUTTERFLY video review for Max Must Know. 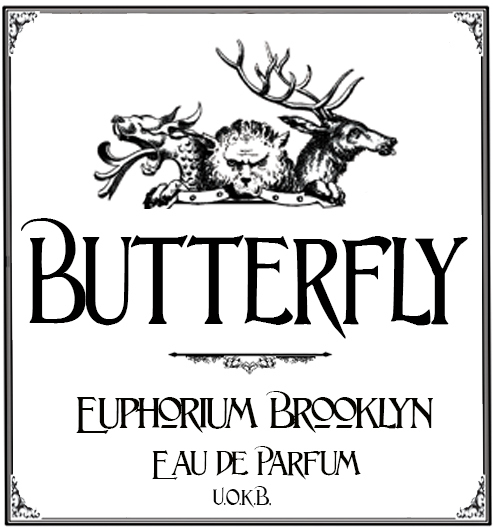 Jodi Battershell’s preview of BUTTERFLY on Fragrantica. 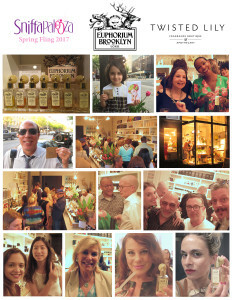 Hernando Patrick Courtright, Michelyn Camen EIC Cafleurebon’s Spring Fling BUTTERFLY presentation event review. 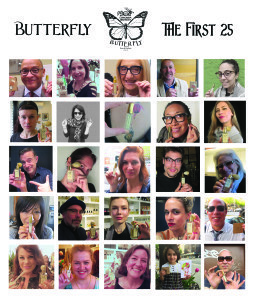 Snapshot portraits and first impressions at BUTTERFLY First Encounters.